First results from the Messenger Mission to Mercury Published. The Messenger Mission was launched on 3 August 2004 and moved into orbit around Mercury in March 2011, after a rather circuitous trip, involving a flyby of Earth, two of Venus and three of Mercury itself. It has been transmitting a steady stream of information back to Earth for six months now. This week NASA published the first findings derived from this information in a series of papers in the journal Science. An animation showing the route Messenger took to Mercury. The first two papers concerned the composition of rocks on the surface of Mercury, and the inferences that could be made about the origins of the planet from this. The first of these papers, by a team led by Larry Nittler of the Department of Terrestrial Magnetism at the Carnegie Institution in Washington DC focuses on the abundance of common elements in the crust. This reveals that the surface of Mercury has an extremely rich in magnesium and poor in aluminium and calcium compared to other terrestrial planets, and that it is also extremely rich in sulphur. The second paper, by a team led by Patrick Peplowski of the Applied Physics Laboratory at Johns Hopkins University concentrated on radioactive elements, finding the surface of Mercury to have an unusual abundance of radioactive potassium, relative to the radioactive elements thorium and uranium. These findings both suggest that the surface of Mercury has a highly evolved surface; that is to say that it is likely to have been formed from a medium with a more usual balance of elements, which was then separated out by some process, similar to the separation of elements that occurs in lavas cooling slowly within a volcano. The third paper, by a team led by James Head of the Department of Geological Sciences at Brown University, studied the physical geology of Mercury's northern hemisphere. This revealed that a vast area of the planet, in excess of 6% of the total surface, was covered by vast areas of flood basalt. Flood basalts are areas where vast amounts of volcanic rock have erupted onto the surface of a planet at one time. On Earth these have been associated with mass extinction events; the Deccan Traps in India are associated with the end of the Cretaceous, and the larger Siberian Traps in Russia (less reliably) with the end of the Permian. However the extent of flood basalts far outstrips anything seen on Earth, and implies a catastrophic event on a scale far beyond anything Earth has ever seen (though rather less likely to have caused a mass extinction, given Mercury's lack of an atmosphere, and therefore life). 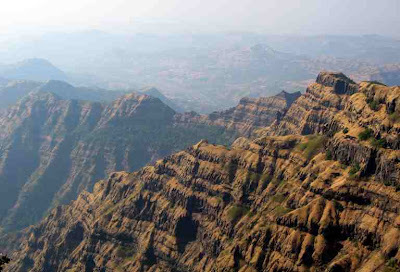 The Deccan Traps; layer after layer of volcanic rock covering a vast area of eastern India. The fourth paper is by a team led by David Blewit, also of the Applied Physics Laboratory at Johns Hopkins University. This deals with a feature seen on the surface of Mercury that has never been seen on any other planet or moon. Many craters on Mercury are dotted with mysterious, highly reflective blue cavities, or hollows, ranging in size from a few tens of meters to several kilometers across. Blewit et al. theorize that these have formed where minerals have sublimated (passed from a solid to a gaseous phase, without ever being a liquid) in the intense heat at Mercury's surface. 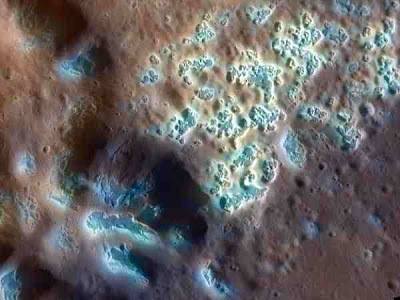 Mysterious blue hollows on the surface of Mercury. The fourth paper is by a team led by Brian Anderson, again of the Applied Physics Laboratory at Johns Hopkins University, and concerns Mercury's magnetic field. This is very week compared to that of Earth - about 1.1% the strength - but far stronger than those of Mars or Venus. The magnetic poles of Mercury are very close to the geographical poles (the points on the end of a hypothetical line about which the planet spins), only about 3% off. This suggests that the field is being generated by the spinning of a liquid iron core within the planet. In the absence of an atmosphere this week magnetic field is the only protection that the planet has from the solar winds (a stream of charged particles constantly emitted by the sun) - and it isn't quite enough, as these winds actually touch the planet at the poles. This leads to the ionization of atoms at the surface, generating a planetary field of charged ions which is the subject of the fifth paper in the journal. In this paper a team led by Thomas Zurbuchen of the Department of Atmospheric, Oceanic and Space Sciences at the University of Michigan analyse this field, finding it to be rich in positively charged sodium and oxygen ions (i.e. sodium and oxygen atoms that have been stripped of one or more electrons), which on the side of the planet away from the sun rival the density of free protons (ionized hydrogen particles). There is also a considerable density of ionized helium atoms, though these are more evenly distributed. The sixth paper also concerns Mercury's magnetic field. In this study a team led by George Ho of the Applied Physics Laboratory at Johns Hopkins University study the (intense) electron field about Mercury and come to the conclusion that the planet's magnetic field is to week to generate Van Allen radiation belts; torus shaped belts of charged particles that surround the Earth and other planets with strong magnetic fields, leading to Mercury having fields with less well defined shapes. See also Saturn's moon Dione found to have an atmosphere, Running water on present day Mars and The surface of Vesta. Tourists evacuated due to volcanic activity on El Hierro in the Canary Islands. El Hierro is the southwesternmost of the Canary Islands, the tip of an ancient shield volcano that rises 1500 m above sea level. The Canary Islands are all volcanic in origin, sitting on a volcanic hotspot that has been moving east to west throwing up volcanoes for at least 60 million years (strictly speaking the hotspot has been staying still while the overlying Atlantic crust moves east). Technically El Hierro is part of the rim of the crater of an older volcano, El Golfo, which collapsed around 130 000 years ago. The island appeared above the sea about 1.2 million years ago, in the east the oldest of the islands, Feurteventura, is thought to be about 20.6 million years old. There are seven major islands in the Canaries; El Hierro, La Palma, La Gomera, Tenerife, Gran Canaria, Fuerteventura and Lanzarote. All of these except La Gomera have their own volcano; La Gomera probably did but is highly eroded, to the extent that it is not possible to be certain where the volcanic eruptions that produced the island were centered. There are also a number of seamounts (submarine volcanoes) associated with the islands; notable South and Henry Seamounts, to the south and southeast of El Hierro, and Casablanca Seamount to the east of Fuerteventura. Despite being the youngest of the islands, El Hierro has not been active for a long time. The last reported eruption on the island was in 1793, when lava erupted from a vent on the northwest of the island for about a month. Prior to this there may have been eruptions in 1692 and 1677. Significant lava flows on the island have been dated to 550 BC, 950 BC and 4790 BC. 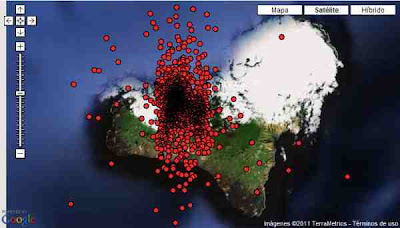 In July this year (2011) the Instituto Geográfico Nacional began to detect small earthquakes occurring deep beneath the island. These quakes were happening at a depth of about 10 km, though all were small, with magnitudes bellow 3 on the Richter Scale. This sort of activity near a volcano is often indicative of magma movements beneath the surface which may lead to a future volcanic eruption. Since July there have been over 7200 such minor earthquakes on Hierro, but in September they suddenly became much more frequent, with over 900 occuring between the 8th and 19th of the month, three large enough to have been felt by people living at the surface. The epicenters of earthquakes on El Hierro since July 2011. On Wednesday this week (28 September) rocks were seen being thrown from the Pico de Malpaso summit, the highest peak on the island. At this point the local police made the decision to begin evacuating people from the immediate area. Initially 53 people have been evacuated from properties close to the mountain, but preparations are being made to evacuate up to 2000 of the islands' 11 000 inhabitants. The authorities do not expect a major eruption on the island, but are concerned about the hazards presented by volcanic bombs (hot rocks thrown from volcanoes). The threat of a major volcanic eruption in the Canary Islands is taken seriously by geologists. In 1999 a team led by Simon Day of the Benefield Grieg Hazard Research Centre at University College London published a paper in the Journal of Volcanology and Geothermal Research in which they concluded that a major eruption in the Canary Islands could lead to a flank collapse, triggering a tsunami that could devastate the coasts of countries around the Atlantic Ocean, including the US, Brazil and Western Europe. 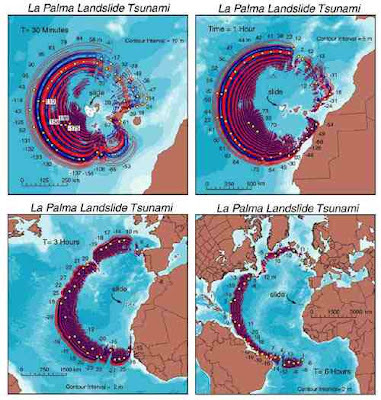 The evolution of a hypothetical tsunami centered on La Palma in the Canaries. See also The dangers of a modern Laki-style eruption in Iceland, Scientists predict eruption of Axial Seamount and Volcanoes on Sciency Thoughts YouTube. 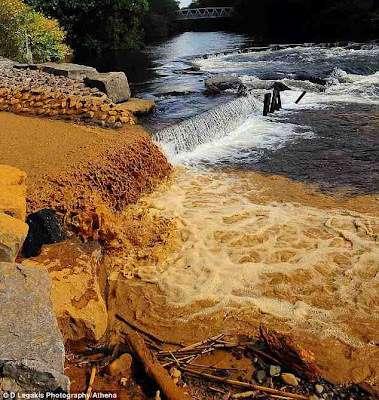 River Neath turned orange by mining run-off. 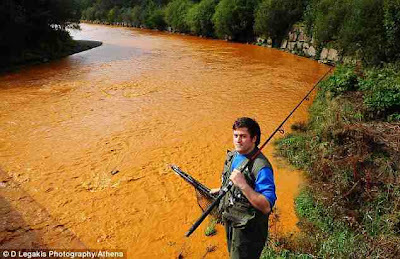 On Friday 24 September 2011 anglers on the River Neath in South Wales reported that a stretch of the river between Abergarwed and Neath Town had turned a muddy orange colour, and that a number of fish could be seen to be visibly in distress. An angler by the River Neath. An investigation by the Environment Agency Wales revealed that the pollution was entering the river from the Garwed Brook, and found a number of dead fish, small bullheads, due to oxygen depletion. The river was pH tested, but was not found to have been acidified sufficiently to warrant remedial action. The Environment Agency concluded that the source of the pollution was almost certainly a mine working; of which there are a number in the area, mostly disused. The worst of the pollution has now cleared, but the Environment Agency are working with the Coal Authority to find the source of the contamination, with the hope that any future incidents can be prevented. Pollution from the Garwed Brook entering the River Neath. This is the second incident in South Wales relating to rainfall entering disused mines this month; on the 15th four miners were killed at the Gleision Colliery near Swansea after water entered the mine from a flooded, disused working. This is somewhat of a mystery as Wales has experienced an unusually cool and dry summer. One of the predictions made by climate scientists studying the effects of global warming is that rainfall patterns will alter as the world warms. This is likely to lead to an increase in the number of incidents of this kind, as water levels change in ways that are hard predict. However there is no evidence to suggest that these incidents are the result of global warming. See also Disaster at the Gleision Colliery. Just how big is Iota Draconis b? Iota Draconis is a K-type orange giant star in the constellation of Draconis, 103 light years from Earth. 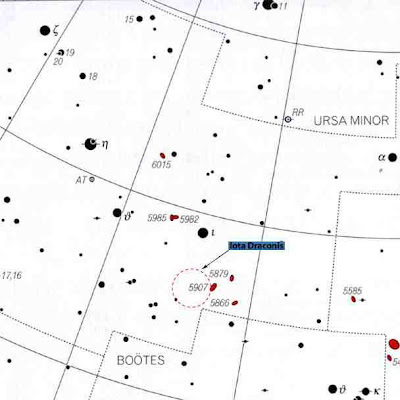 It has an apparent magnitude of 3.31, making it naked-eye visible. In 2002 a paper in The Astrophysical Journal by a team lead by Sabine Frink of the Center for Astrophysics and Space Sciences at the University of California, San Diego reported the discovery of a planet orbiting this star, dubbed Iota Draconis b; 'b' implying the second body in the system if it were capitalized, as 'B', it would imply a second star. The location of Iota Draconis. The discovery was made at the Lick Observatory at Mount Hamilton in California, where the researchers were studying variations in the radial velocities of K-type stars through minute variations in the Doppler Shift, with a view to discovering binary systems (the radial velocity is movement directly towards or away from the observer). Since the study was looking at a large number of K-type stars it was considered a possibility that large planets might be detected, but this was not the primary purpose of the study; in 2002 exoplanet discovery was a new field and the equipment available at Lick was at the lower resolution limit for this type of detection. A visualization of how the mass of a planet effects the radial velocity of a star. Based upon observations and careful modeling of the possible fluctuations in the radial velocity of Iota Draconis, Frink et al. calculated that the star was orbited by a superjovian (bigger than Jupiter) planet once every 536 days. The planet orbited the star at an average distance of 1.3 AU, that is to say 1.3 × the distance at which the Earth orbits the Sun, but with an eccentricity of 0.70. This means that at its closest the planet is only 0.4 AU from the star, and at its furthest 2.2 AU. The mass of the planet could only be calculated by its effect on the star, i.e. by observing the movement of the star, the astronomers were able to calculate the mass of the planet as a ratio of that of the star. At the time the best guess for the mass of Iota Draconis was about 1.05 times that of our sun, giving a minimum mass for the planet of at least 8.9 × that of Jupiter. This placed Iota Draconis b in a category of planets know as 'Eccentric Jupiters'; planets with masses comparable to or greater than that of Jupiter with highly eccentric orbits. Such planets are very alien to us, as they do not resemble anything in our solar system, but they are one of the best known groups of exoplanets, since their large masses and eccentric orbits make them relatively easy to detect. In the early days of exoplanet-hunting more than 50% of all planets detected were Eccentric Jupiters. In 2008 a team lead by Mathais Zechmeister of the Max-Planck-Institut für Astronomie published a paper in the journal Astronomy and Astrophysics in which they describe the results of a more long term study of the radial velocity of Iota Draconis from the Lick Observatory and in addition the Thuringia State Observatory in Germany and the McDonald Observatory in Texas, combined with improved methods for calculating the size of K-type giants. Based upon this they calculated that Iota Draconis b orbits its star every 511 days, slightly less than calculated by Frink et al. They also calculated that the star in the system was somewhat larger than originally thought, between 1.4 and 2.2 × the mass of the sun. Based upon this revised mass Iota Draconis b would have a mass at least 10 × that of Jupiter. On 22 September this year a team lead by Ellyn Baines of the Remote Sensing Division at the Naval Research Laboratory in Washington DC published a paper on the arXiv database at Cornell University Library, in which they detail further study of the Iota Draconis system, using Georgia State University's Centre for High Angular Resolution Astronomy Array interferometer. Using this data they were able to re-calculate the mass of both the star and planet, and the temperature of the star. Using this new data Baines et al. were able to derive a far more accurate estimate of the mass of Iota Draconis, at 1.82 × the mass of the sun. Using this mass to calculate the size of Iota Draconis b they came up with a mass of 12.6 × that of Jupiter. This is pushing the limits of what can be comfortably described as a planet; some astronomers consider that objects with masses as low as 10 × that of Jupiter should be considered to be brown dwarfs; the International Astronomical Union sets the limit at 13 Jupiter-masses, within the margin of error for the mass of Iota Draconis b. A brown dwarf is considered to be an object to small to fuse hydrogen in its core, but large enough to fuse deuterium (deuterium is an isotope of hydrogen with a proton, giving it an atomic mass of 2, as opposed to 1 for regular hydrogen). 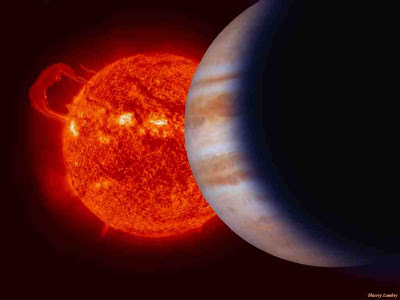 In an object with a mass of 13 × Jupiter then this would be a fairly short-lived process; the object would, assuming it could be sampled directly, be defined as a brown dwarf by the absence of deuterium. Baines et al. were also able to derive an estimate of the surface temperature of 4545K for Iota Draconis (as opposed to 5778K for our sun). From this the derived an estimate for the positioning of a 'Goldilocks Zone' (i.e. a zone in which planets could support life as we understand it) in the Iota Draconis system. This they estimate at occurring between 6.8 and 13.5 AU - far outside the orbit of Iota Draconis b. This is much further out from the star than Earth is, despite the fact that our sun it hotter; this distance is due to the larger size (diameter) of the star. However it seems unlikely that the Iota Draconis system could host inhabitable planets, since they would need to maintain a stable, not-to-eccentric orbit in a system with a very large planet/small brown dwarf in a very eccentric orbit. Furthermore Iota Draconis is a giant star, a star that has completed its main sequence evolution, used up all its hydrogen fuel and switched to the fusion of other heavier elements, causing it to expand. This expansion would have caused the habitable zone to shift outwards within the system, killing any life which did not have the ability to move its planet, though it is in theory possible that life could have started on a planet after the Goldilocks Zone had shifted out to meet it. An artists impression of the Iota Draconis system. See also Kepler-16 (AB)b; the first planet discovered orbiting a binary star, Kepler-19; new planetary system discovered and Exolanets on Sciency Thoughts YouTube. A new Troodontid Dinosaur with an injured toe. The Troodontids are a group of small-to-medium-sized therapod dinosaurs closely related to the birds. They are often referred to as feathered dinosaurs, though they are certainly not the only feathered non-avian dinosaurs. The group are quite diverse, and appear to have followed a variety of lifestyles; at least one species appears to have evolved the ability to fly independent of the birds. It is quite likely that the Troodontids were one of the most numerous dinosaur groups in the Late Cretaceous, but that they have not been as widely preserved as more robust groups. The September 2011 edition of the online journal PLoS ONE contains a paper by a team lead by Lindsay Zanno of the Field Museum of Natural History in Chicago and the Biological Sciences Department at the University of Wisconsin-Parkside, describing a new Troodontid, Talos sampsoni, from the Upper Cretaceous Kaiparowits Formation of Utah, North America. Talos is described from an incomplete skeleton comprising most of the pelvis and legs, as well as some vertebrae and part of one forearm. It is estimated that the complete skeleton would have been about 2 m in length. Reconstruction of Talos sampsoni from the available parts of the skeleton. Drawing by Scott Hartman. An unusual feature of this specimen is an injury to the second digit of the left foot. This injury appears to have been quite severe, so that the toe, while healed, is quite badly deformed. This sheds light on how the digit was used in life, since if this had been a weight bearing toe the an injury of this sort would have required the animal to modify its gait considerably, leading to distortion of other bones of the foot. Since this is not the case it is assumed that the toe did not bear weight, and must therefore have had some other function most probably as a weapon, as is seen in the (related) raptors and some species of modern birds. Injuries in such a digit would not be uncommon, but would not greatly endanger the animals survival. This feature has been seen previously in a number of Troodontids, though this is the first time palaeontologists have been able to confirm the toe is non-load bearing. Reconstruction of Talos sampsoni, with an enlarged view of the foot. Image by Jorge Gozales of the Utah Museum of Natural History. Troodontids are closely related to the 'raptor' dinosaurs (Dromaeosaurs), which are noted for their enlarged toe claws, but this appears to be a derived feature in the Troodontids; the earliest forms did not have it, and it appears to have developed in one lineage within the group. There are over twenty species of described Troodontid, mostly from the Late Cretaceous. They are best known from Asia, though Talos joins a small number of North American specimens, and there are two named European species. It is quite possible that they were more widespread. One possible species, Koparion douglassi, has been described from the Upper Jurassic, based upon isolated teeth from the Morrison Formation of Utah, though the designation of this as a Troodontid as at best controversial. Another, as yet undescribed, specimen has apparently been found in the Morrison Formation of Wyoming and is being held at the Wyoming Dinosaur Center while it awaits formal description. This specimen, WDC DML 001, is said to be substantially complete and clearly identifiable as a Troodontid. An Early Cretaceous Troodontid has been described from Utah. 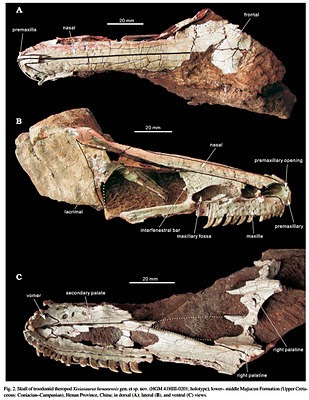 Germiniraptor suarezarem was described from an upper jaw found in the Cedar Mountain Formation in a 2010 paper in PLoS ONE by a team lead by Phil Senter of the Department of Biological Sciences at Fayetteville State University. Early Cretaceous Troodontids are also known from Asia. A common Early Cretaceous Troodontid from China appears to have been Sinovenator changii; this was originally described in a paper in the journal Nature by a team led by Xing Xu of the Chinese Academy of Sciences, based upon two specimens from the Yixian Formation, but Xu and Mark Norell of the American Museum of Natural History later reported that there are hundreds more undescribed specimens in a paper in the Geological Journal. 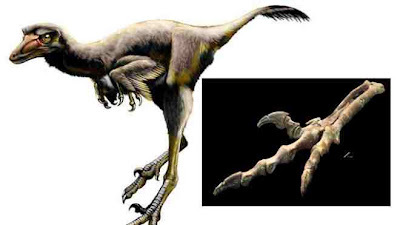 Sinoventor was a chicken-sized dinosaur with feathers, long legs and a raised second digit on each hind foot, which had led to speculation that this was used as a weapon in a way similar to the related raptors; speculation which appears to have been justified by the discovery of Talos sampsoni. A reconstruction of Sinovenator changii by Scott Hartman. Jinfengopteryx elegans was described from a single, 55 cm, largely intact, well-feathered specimen from the Huajiying Formation of Hebei in eastern China. It was originally described as a bird, though is now considered to be a small Troodontid. Jinfengopteryx elegans, a bird-like Troodontid from the Lower Cretaceous of China. Another Early Cretaceous Troodontid from China is Mei long, named from a small (40 cm) probably juvenile specimen found in a position which suggests it had been sleeping, bird-like, with its head tucked under one fore-limb at the time of its death. Mei long was discovered in Liaoning Province in eastern China and described by Xing Xu or the Institute of Vertebrate Paleontology and Paleoanthropology at the Chinese Academy of Sciences and Mark Norell of the American Museum of Natural History in a paper in the journal Nature. Reconstruction of Mei long by Natural History Illustrator Julius Csotonyi. 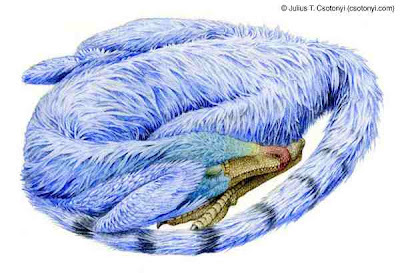 A second species of Early Jurassic Troodontid has also been found in this roosting position. Sinorthoides youngi was discovered in the Ejinhoro Formation in Inner Mongolia and described in a paper in the Canadian Journal of Earth Sciences by Dale Russell of the Department of Marine, Earth and Atmospheric Sciences at North Carolina State University and Dong Zhimeng of the Institute of Vertebrate Paleontology and Paleoanthropology at the Chinese Academy of Sciences. It was about a meter long. A CAT Scan of Sinornithoides youngi. 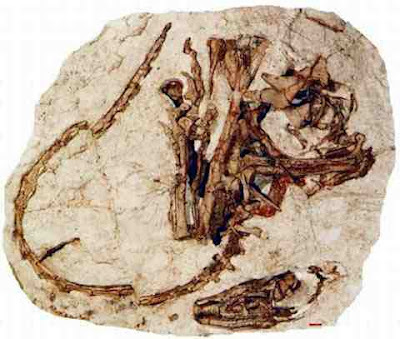 Another Early Jurassic species from China was Sinusonasus magnodens, described from a partial skeleton found in the Yixian Formation in Lioaning Province in a paper in the journal Acta Geologica Sinica by Xu Xing and Wang Xiaolin of the Institute of Vertebrate Paleontology and Paleoanthropology at the Chinese Academy of Sciences. Sinusonasus was about a meter long with enlarged teeth in its upper jaw. There is also an Early Cretaceous Troodontid from Mongolia, specimen SPS 100/44, which has not been formally named as it is a partial skeleton lacking sufficient distinguishing features to rule out its being a juvenile of another species. SPS 100/44 was discovered at the southern Goby Desert Khamareen Us location by Sergei Mikhailovich Kurzanov of the Paleontological Institute of the Academy of Sciences of the USSR during the 1979 Soviet-Mongolian Paleontological Expedition, and described in a paper in the journal Acta Palaeontologica Polonica by a team lead by Rinchin Barsbold of the Institute of Geology in Ulaanbaatar. The group reached the peak of its diversity in the Late Cretaceous, and appears to have been going strong right up to the KT Boundary, though unlike the closely related birds they do not appear to have survived into the Tertiary. A number of North American forms have been collected together under the generic name Troodon, though it is probable that this refers to a range of distinct species known from fragmentary skeletons. The names Paranychodon, Richardoestesia, Pectinodon, Polyodontosaurus, Steynonychosaurus and Saurornithoides have also been used for Late Cretaceous Troodontids, though it is not clear that any of these represent distinct forms as described. Zanno et al. observe that the North American Troodontids are in need of a comprehensive reclassification. That said, a 'typical' specimen of Troodon was a two-and-a-half meter long, bird-like dinosaur weighing about 50 kg, with a raised claw on the second toe of each hind foot, forward facing eyes, and a large brain. No specimen with feathers has been found, but it is thought likely to Troodon did have plumage, given its similarity to species known to be feathered. Another dubious form is Archaeornithoides, named from a fragmentary skull found in the Djadokhta Formation in Mongolia. Archaeornithoides was described in a paper in the journal Nature by Andrzej Elzanowski of the Max Planck Institut fur Biochemie and Peter Welnhoffer of the Bayerische Staatssammiung fuür Paläontologie und historische Geologie. It is an extremely bird-like form, but it is difficult to say whether it is genuinely a separate species from the material available. Also from Mongolia comes Borogovia gracilis, a Troodontid known only from a single pair of partial hindlimbs, which imply an animal roughly 2 m in length. As with Archaeornithoides it is difficult to see if Borogovia genuinely represents a separate species from the available material. Borogovia was described in a paper in the journal Acta Palaeontologica Polonica by Halszka Osmólka of the Polska Akademia Nauk. A third dubious Mongolian Troodontid from the Late Cretaceous is Tochisaurus nemegtensis, described from a single bone, the metatarsus (a bone in the foot). A better described Mongolian species is Byronosaurus jaffei, known from two partial adult skeletons, both with skulls and two juvenile skulls. Byronosaurus was about 150 cm long and about 50 cm high; it probably weighed no more than 4 kg. The two juvenile specimens were found in an Oviraraptorsaur nest; they were probably prey items, but there has been some speculation that this may represent brood parasitism, as in modern cuckoos or cow-birds. Byronosaurus was described in a paper in the journal Science by a team lead by Mark Norell of the American Museum of Natural History. 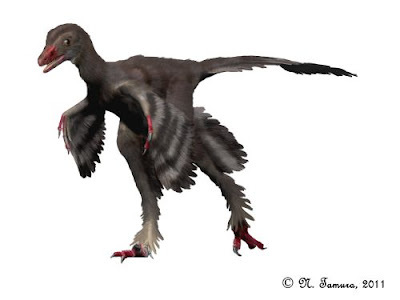 Another Late Cretaceous Mongolian Troodontid is Saurornithoides mongoliensis. This is a particularly large species, estimated to be 2-3 m long and to weigh between 23 and 54 kg, described from a single specimen from the Djadochta Formation found during one of Roy Chapman Adams's trips to Mongolia, and described in a paper in the American Museum Noviates by Henry Fairfield Osborn of the American Museum of Natural History. Saurornithiodes had binocular vision and an enlarged second toe claw on each foot. A second species of large, Late Cretaceous, Mongolian Troodontid was originally placed in the genus Saurornithiodes, but is now considered sufficiently distinct to merit its own genus. This is Zanabazar junior, originally described from a skull and partial skeleton by Rinchen Barsbold, and reclassified in a paper in the American Museum Noviates by a team lead by Mark Norell of the American Museum of Natural History. 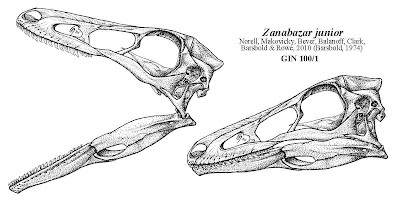 The skull of Zanabazar junior. Linhevenator tani comes from the Late Cretaceous of Inner Mongolia, China. It was described in a paper in PLoS ONE by a team lead by Xu Xing of the Chinese Academy of Sciences, from a single specimen, LVH0021 from the Mandahu Formation in the Linhe region. 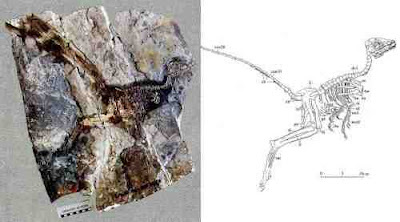 The specimen was fragmentary, but largely complete; certainly enough that Linhevenator can be considered to be a separate species with confidence. 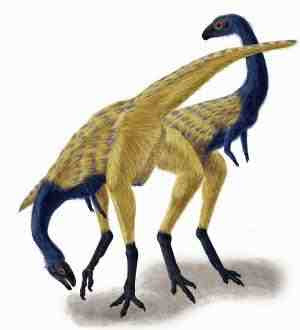 It is a large Troodontid, weighing about 23 kg, and had a raised claw on the second digit of each hind foot. 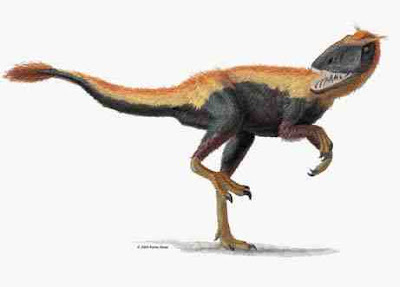 Reconstruction of Linhevenator tani by dinosaur artist Nobu Tamara. Xixiasaurus henansis is a species of Late Cretaceous Troodontid described from a partial skull from the Majiacun Formation in Henan Province in eastern China. The skull is well preserved, but again the possibility that this species has been described elsewhere from other body parts cannot be ruled out. The description was published in a paper in the journal Acta Palaeontologica Polonica by a team led by Junchang Lü of the Institute of Geology at the Chinese Academy of Geological Sciences. The skull of Xixiasuarus henansis. Urbacodon itemirensis is a Troodontid dinosaur from the Late Cretaceous of Uzbekistan. It was described from a partial lower jaw, with teeth, and could well, therefore, have been described elsewhere as another species from a different part of its anatomy. The description of Urbacodon was published in a paper in the Journal of Vertebrate Paleontology by Alexander Averianov of the Zoological Institute of the Russian Academy of Sciences and Hans-Dieter Sues of the National Museum of Natural History at the Smithsonian Institution. Two highly dubious Troodontids have been described from Europe. Elopteryx nopcsai was described from a partial femur and tibia from Romania, though the tibia is now considered to be from a separate animal. Euronychodon portucalensis was described from a single tooth from Portugal. A second species of Euronychodon, E. asiaticus was later described from a single tooth from Uzbekistan; this is considered an even more dubious classification. See also Dinosaur feathers preserved in amber, New 'oldest bird' found in China, The Ashdown Maniraptoran and Dinosaurs on Sciency Thoughts YouTube. Himilayan Earthquake. 18 September 2011. On Sunday 18 September 2011, slightly after ten-past-six in the evening an earthquake with a magnitude of 6.9 on the Richter Scale occurred in the southern Himalayas, roughly 42 km to the northwest of Gangtok, the capital of the Indian province of Sikkim, at a depth of 19.7 km. This was large enough and shallow enough to cause widespread damage and casualties in several nations. The epicenter of the quake was across the border in the Kanchenjunga Conservation Area in Nepal, an area of protected forests and mountains that continues east into Sikkim as the Kangchengdzonga National Park and northward into Tibet as the Qomolangma Biosphere Reserve. This makes the area where the quake occurred fairly sparsely populated, which will have kept the number of casualties down, but which also means that people who have been effected will be a long way from help. Several days after the quake reports of casualties are still coming in. The Sikkim/Nepal border region is extremely mountainous with few roads and those roads that do exist have been widely damaged by landslides, hampering attempts to reach remote communities. On the Indian side of the border 5000 troops have been deployed to Sikkin to assist the local authorities, and have set up emergency camps to house over 2000 people made homeless by the quake. At least 150 people have been admitted to hospital and 42 have been confirmed dead. A number of buildings are reported to have collapsed in Gangtok, the state capital, and rescuers are still sifting through the rubble, so the death toll may rise. There are a number of hydro-electric dams in Sikkim, but none of these appear to have been damaged. There are also reports of four deaths in west Bengal State and two in Bihar. The remains of a Buddhist monastery in Gangtok. In Nepal nine people were reported killed and over a hundred injured. Of these six of the fatalities and half the injuries were in the capital, Kathmandu, 272 km to the west of the epicenter. This was largely due to overcrowding and poor building standards in the city, which has grown rapidly in the last couple of decades as people have fled a bloody civil war which lasted from 1996 till 2006. A wall of the British Embassy is reported to have collapsed, killing three people. 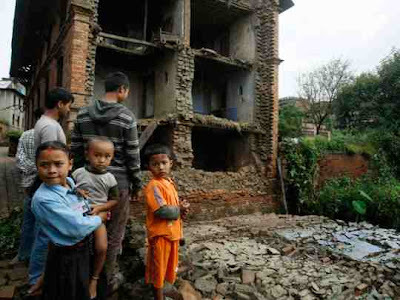 Survivors surveying damage in Kathmandu. In Tibet landslides closed a number of roads and seven people have been reportedly killed. 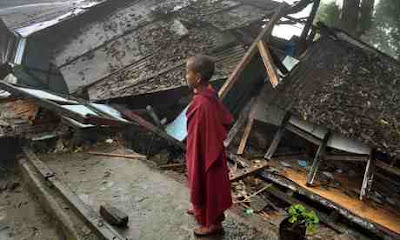 The quake was also felt in Bhutan and Bangladesh, though there are no reports of any casualties in either country. The Himalayas are highly prone to earthquakes as they are located on a convergent plate margin, where the Indian Plate is colliding with the Eurasian. Other convergent plate margins are associated with volcanic activity, for example in the Andes where the Pacific Plate is being subuducted beneath the South American, but since both India and Eurasia are continental land masses this cannot occur so they have been forced upwards creating the Himalayan Mountains and the Tibetan Plateau. This has lead to many devastating earthquakes in the region. In 2005 an earthquake in Kashmir killed between 75 000 and 80 000 people (possibly more) in Pakistan, India and Afghanistan. The capital of Pakistan-administered Kashmir, Muzzaffarabad and the neighboring city of Bagh were partially destroyed and much of the infrastructure in the region collapsed. This was followed by a major international aid effort, which was marred by allegations of corruption in the Pakistani military. Rescuers sifting through the remains of Balakot, near the Khyber Pass in Pakistan. 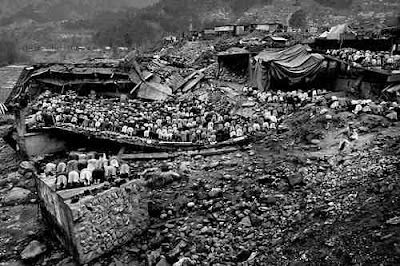 In 1991 over 2000 people were killed by a quake in Uttarkhashi, in the Indian state of Uttarakhand, to the northwest of Nepal. In 1950 an earthquake on the Assam/Tibbet border killed over 1500 people. In 1934 an earthquake in Nepal killed over 8500 people and destroyed over 80 000 buildings. In 1897 an earthquake in Assam killed over 1500 people in India, Bhutan and Burma, and damaged buildings as far away as Delhi. GeoHazards International, a US based non-profit organization which seeks to lessen the impact of earthquakes and other geological hazards through forward planning, has identified Kathmandu as the worlds most at-risk city for potential earthquake damage. The city lies in an area where major earthquakes happen on average once every 75 years, and where there has not been a quake for 77 years, making one overdue. On top of this the city has expanded rapidly in recent years, it now houses over 2 million people, but with few concessions to the potential threat of earthquakes. Building standards tend to be poor, with almost no earthquake-proofed buildings, and the city can only be reached by three roads and an airport. 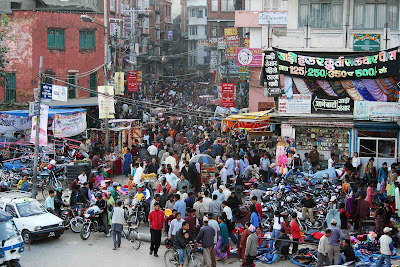 Overcrowded Kathmandu is thought to be extremely vulnerable to earthquakes. See also Earthquake in Mojen, northern Iran, Magnitude 5.1 Earthquake in Western Tibet/Xizang and Earthquakes on Sciency Thoughts YouTube. Labels: Earthquake, Eurasian Plate, Geohazards, Himalayas, Indian Plate, Nepal, Sikkim, Tibbet. The dangers of a modern Laki style eruption in Iceland. Laki, or Lakigígar, is a volcano in southern Iceland, it is a part of the Grímsvötn Volcanic Complex, which has been in the news this year. In June 1773 Laki erupted, not from its summit, but from a number of fissures in its side. These fissures produced a lava fountain that reached 1400 m into the air, and a column of ash and gasses ten times as high. This eruption persisted for eight months, during which time it is thought to have produced 14 km³ on lava, and clouds of ash and gas that reached around the globe, with devastating effects. The gasses produced by Laki were unusually rich in sulphur dioxide (SO₂), which is a lethal poison, and lead to many thousands of deaths in Iceland in Europe. In total Laki is thought to have killed around 6 million people worldwide, through a combination of sulphur dioxide poisoning, the climatic effects of the ash and aerosols and famine resulting from both, and to have contributed to the famine that triggered the French Revolution. The French Revolution - an unusual side effect of a volcanic eruption. 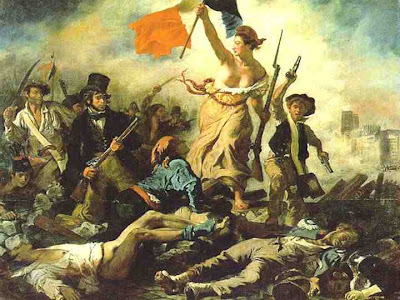 Image by Eugene Delacroix. As a one-off event this would be historically interesting, if a little sad, but Laki was not a one-off event. Iceland is located on a divergent margin, where two of the Earth's larger tectonic plates (North America and Eurasia) are drawing apart and new crust is being formed. This makes it an extremely volcanically active environment, with eruptions, at least on a minor scale, happening more-or-less constantly. In the past two years there have been two eruptions large enough to cause major disruption to air-traffic in Europe - Eyjafjallajökull and Grímsvötn. Seen in this context it is not surprising to discover that there have been other Laki-type eruptions - four in the last 1150 years. This makes the likely-hood of another Laki-type eruption occurring in the foreseeable future worth worrying about; it is clearly a far more likely hazard than (for example) the danger of a major meteor strike, a scenario which has received considerable investigation in recent years. The 20 September edition of the Proceedings of the National Academy of Sciences (vol. 108, no. 38), contains a paper by a team lead by Anja Schmidt of the School of Earth and Environment at the University of Leeds, in which they model the effects of a possible Laki-type eruption on modern day Europe. Schmidt et al. begin by observing that the modern world is very different from the world of the late eighteenth century. Our scientific understanding of our environment and medical skills are far in advance of theirs, and we have the ability to respond to large scale problems in ways that simply not available then. Our populations are on the whole healthier than they were two centuries ago, but they are also older, making them vulnerable in different ways, and far larger, so that a lower fatality rate may well result in more deaths. The country worst effected by the 1783-4 eruption was Iceland itself, with clouds of volcanic haze, rich in sulphur dioxide, covering much of the country, leading to the deaths of around 10 000 people, between 20 and 25% of the population. In addition between 50 and 75% of the island's livestock is thought to have perished. At the time nobody knew what sulphur dioxide was, so they were able to do little to respond to the problem. In modern Iceland the activities of all volcanoes are carefully monitored by the Icelandic Met Office, which also pays careful attention to air pollution arising from these activities. This should enable the country to take prompt action if confronted by a major volcanic haze problem, evacuating people where necessary and providing some protection to those who cannot be evacuated, though one on the scale of the 1783 Laki eruption would still cause considerable problems, so it is likely that there would still be fatalities. 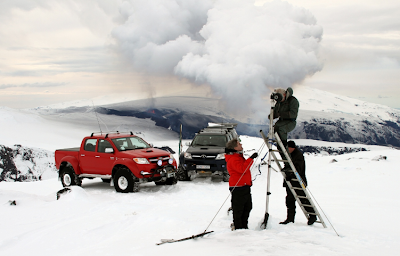 Icelandic scientists monitoring emissions from Mount Eyjafjallajökull. In addition to the poisoning by sulphur dioxide, it is likely that many of the deaths in Iceland in 1783-4 were caused by famine, as crops and livestock were smothered by ash, or poisoned by hydrofluoric acid (the ash was unusually rich in this lethal compound). This should be far less of a problem, as modern Iceland would be able to import food to get it through any crop failures, something which was not an option in the 1780s. In total Schmidt et al. estimate that confronted with a modern Laki-type eruption on a similar scale to the 1783-4 eruption then they could potentially loose up to 400 people, which would be tragic, but is far less devastating than the eighteenth century losses. From Iceland the volcanic haze drifted east to Europe, which was already suffering from an unprecedented heat-wave. Eighteenth century agriculture was far more labour intensive than modern farming, involving many more people working outdoors, doing hard physical labour in the hight of summer. These agricultural workers proved to be particularly vulnerable to the effects of sulphur dioxide poisoning. In Britain it is estimated that 23 000 people died from poisoning in the summer of 1873, predominantly in the eastern English counties, where mortality rates reached three times normal. This was followed by an unusually severe winter, the result of volcanic aerosols, which tend to lower temperatures. This is thought to have lead to another 8000 deaths. Schmidt et al. find that the modern UK is still vulnerable to the effects of a Laki-type eruption. By modeling the effects of sulphur dioxide from known pollution events on a population with the demographic make up of modern Britain, they estimate that approximately 20 900 additional deaths would be caused. This is comparable to the overall number of deaths in the eighteenth century, but represents a much smaller proportion of the population. Across Western Europe they estimate that there would be between 77 500 and 81 900 additional deaths, with casualties particularly severe in the Netherlands and Belgium in addition to the UK. In the 1780s deaths were caused by famine in addition to poisoning. In modern Europe this is less likely to be a problem, but it is possible that if Europe needed to radically increase its food imports for a sustained period that this could cause famine in other, parts of the world. The Schmidt et al. model does not attempt to make predictions beyond Europe, but the effects of the 1893-4 eruption much more far-reaching. It is thought to have interfered with the monsoon pattern in Africa and Asia, leading to famine in North Africa and the Sahel region (grasslands of West Africa), as well as India and Japan. It has also been linked to a particularly hard winter in North America. These effects further afield are far harder to predict. The world has a far better ability to deal with famines than was formerly the case, with co-ordinated international efforts to help famine-hit countries. However it is difficult to predict what might happen in the event of widespread famine across several continents simultaneously. It is possible that developed nations with strong economies might hoard food at the expense of poorer nations, possibly leading to food shortages far from the regions effected by the eruption. It has been suggested that the recent political upheaval in North Africa was at least in part caused by rising food prices, and it is quite possible that a Laki-type eruption might cause widespread political change, just as it did in the eighteenth century. 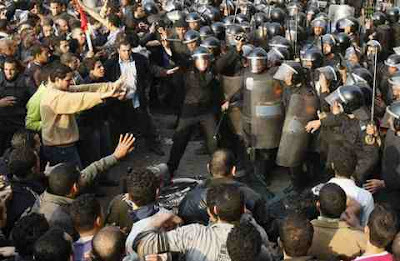 The Egyptian Revolution of 2011 was probably caused at least in part by rising food prices, a result of the global financial crisis. It is possible that a Laki-type eruption could cause similar uprisings in many more countries. See also The Hekla Volcano - is the Gateway to Hell about to open? The Grímsvötn Volcano and Volcanoes on Sciency Thoughts YouTube. 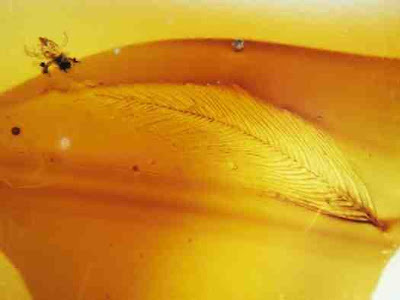 Dinosaur feathers preserved in amber found in eastern Alberta, Canada. Scientists have known that some dinosaurs had feathers for a long while. Archaeopteryx, generally described as the 'first bird' was discovered in 1861, and was quickly recognized as being very similar to a small, feathery dinosaur. Since nobody (sane) thought that evolution would produce a feathery bird from a featherless dinosaur in a single generation, scientists have known that at least some dinosaurs had feathers. In the 1990s well preserved fossils of feathered, non-avian dinosaurs in fine grained lakebed sediments began to emerge from Liaoning in China. These sediments were rich in volcanic ash, allowing for both very fine preservation and excellent dating potential. These specimens detailed a variety of small therapod dinosaurs with a variety of plumage. Reconstruction of Dilong paradoxus, an early tyranosaurid dinosaur with primitive, hairlike feathers from the Liaoning Formation of northwest China. Illustration by artist Portia Sloan. However these fossils, while of excellent quality, only preserve impressions of the feathers, they give no indication of their colour or three-dimensional structure. 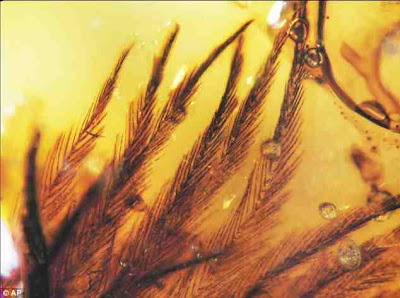 The 16 September edition of the journal Science contains a paper by a team lead by Ryan C. McKellar of the Department of Earth and Atmospheric Sciences at the University of Alberta in which they describe the discovery of a number of Cretaceous era feathers from amber (the preserved resin of coniferous trees) found in mine tailings at Grassy Lake in eastern Alberta, Canada. A Cretaceous feather in amber from Grassy Lake, Alberta. These specimens show a range of feathers including types known only from non-avian dinosaur fossils, preserved in three dimensions, showing their structure in spectacular detail. Unfortunately for fans of Jurassic Park, previous studies on specimens preserved in amber have ruled out the possibility of recovering DNA from specimens preserved in amber. Forked feathers, a form unknown in true birds. These feathers have been widely described as showing the colour of dinosaurs. They show a range of browns and yellows, colours often seen in reconstructions of feathered dinosaurs. Artists have tended to use these colours because they are common in modern feathers, and are common colours for savannah animals, and the fossils apparently confirm the theories of the artists. However amber is a yellowish-brown rock, and almost anything preserved in it will appear this colour, so little can be inferred from this. Illustration of Limusaurus inextricabilis, a small Jurassic ceratosaur from Liaoning. Illustration again by Portia Sloan, who has coloured much of the reconstruction brown, as with D. paradoxus, above. However another paper in the same edition of Science attempts to throw some light upon this. This details how a team lead by Roy Wongelius of the School of Earth, Atmospheric and Environmental Sciences at the University of Manchester have developed an X-ray technique to search for traces of specific metals in pigment residues, enabling them to make inferences about the original colour of the pigment (for example the presence of copper would imply a green colour). This has been used to reconstruct the coloration and patterning of (amongst other things) two Jurassic birds, the crow-like Confuciusornis sanctus and the grebe-like Gansus yumenensis. 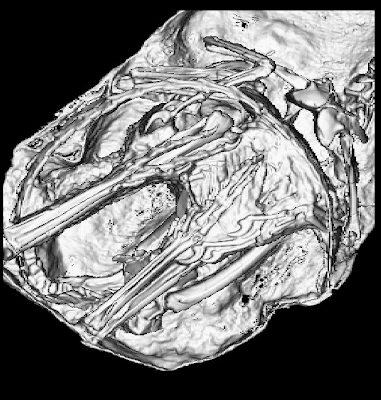 The process of mapping a fossil (Confuciusornis sanctus) using Rapid Scanning X-ray Fluorescence. See also Giant bird from the Cretaceous of Khazakhstan, Head-butting in a Pachycephalosaur and Dinosaurs on Sciency Thoughts YouTube. Kepler-16 (AB)b; the first planet discovered orbiting a binary star. The 16 September edition of the journal Science contains a paper by a team lead by Lawrence R. Doyle of the Carl Sagan Centre for the Study of Life in the Universe, part of the SETI Institute, which describes the discovery of Kepler-16 (AB)b, the first planet found in a binary star system. An animation of the Kepler-16 system. The Kepler-16 system is 196 light years from the Earth in the constellation of Cygnus. It was initially discovered by the Kepler Space Telescope in 2010, when it was listed as KIC (Kepler Input Catalogue) 12644769. The initial observations revealed that the system was a variable star, which careful modeling explained as a binary system, with a larger k-type orange dwarf star, 70% of the size of our sun and 77% as hot, orbited by a smaller m-type red dwarf star, 20% the size of our sun and less than 60% of its temperature, orbiting about a mutual centre of gravity every 41 days. Follow up observations with Kepler and the Tillinghast 1.5 m Telescope at the Fred Lawrence Whipple Observatory of the Smithsonian Astrophysical Observatory revealed the presence of a third body in the system by a 3% dimming of the variable 'star' every 229 days. 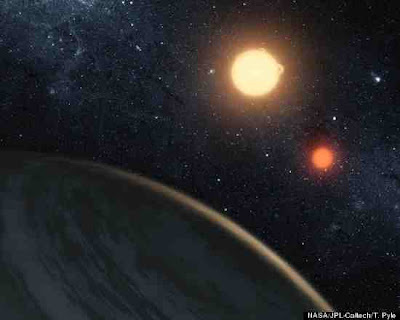 This could not be explained as a third star, so the team new they were dealing with a planet - the first time a planet had been discovered in a binary star system, though this has long been theorized and is a popular concept with science fiction writers. A binary sunset on the planet Tatooine, in the movie Star Wars. The planet was named Kepler-16 (AB)b, implying a planet orbiting both the stars Kepler-16 A and Kepler-16 B. This is slightly misleading as 'b' implies the second body discovered in a stellar system, but it Kepler-16 c could imply a body orbiting just Kepler-16 A, which would be inaccurate as Kepler-16 A is not at the centre of the system. Kepler-16 (AB)b has been widely compared to Tatooine, from the Star Wars movies, the most widely know binary star planet in science fiction, though it is a very different planet. It is roughly the same size as Saturn, though it is much denser, implying a large rocky or icy core, perhaps occupying 50% of the planet's volume. It orbits the centre of the Kepler-16 system at a distance of 0.7 AU, roughly the same distance at which Venus orbits our sun, though it is much cooler, due to the smaller, cooler stars, with an estimated surface temperature of 200 K, far to cold for any form of life as we understand it. Seen from the planet the stars Kepler-16 A and Kepler-16B would always appear close together in the sky, and would eclipse one another every 41 days. Kepler-16A would appear as an orange disk, roughly twice the size of our sun in the sky, Kepler-16 B as a red disk two thirds the size of our sun. An artist's impression of Kepler-16 (AB)b. See also Kepler-19: new planetary system discovered, PSR J1719-1438b. The Diamond Planet and Exoplanets on Sciency Thoughts YouTube. Kepler-19: new planetary system discovered. A Woolly Rhino from the Pliocene of Tibet. Saturn's moon Dione found to have an atmosphere. Hokkaido Earthquake, 7 September 2011. Earthquake in the Netherlands. 8 September 2011.